Caption slip reads: "For Monday. Photographer: Olmo. Date: 1952-05-30. Reporter: Petty. Assignment: German war orphan layout. 1: Sylvia Blanka Schoenhammer Craig, age 2 years, does tricks. 2: Mrs. Paul Craig laces Sylvia's shoes. 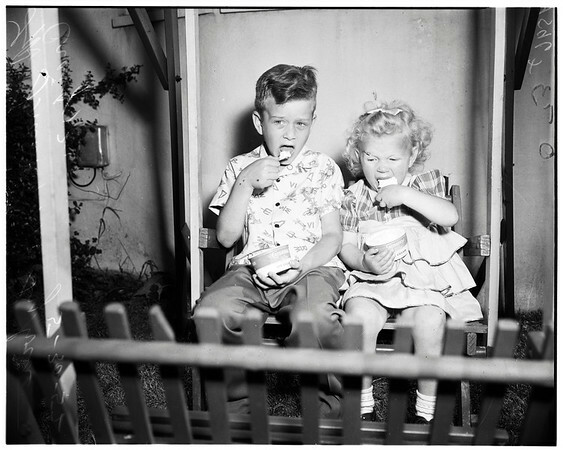 13-14: Frank Craig, 7, and Sylvia enjoy some ice cream. 15-16: Ice cream man Sol Wolkoff sells Sylvia ice cream as Frank Craig waits his turn. 17: Mr. Paul Craig pushes Sylvia and Frank in their swing. 19: Mrs. Paul Craig hands Sylvia her ice cream. 20: Sylvia enjoys her ice cream. 21-22: Frank Craig, 7, and Sylvia, 2, enjoy a picture book. 23-24: Frank and Sylvia play with their dog 'Tippie'".